Byland Abbey is a ruined abbey and a small village in the Ryedale district of North Yorkshire, England, in the North York Moors National Park. It was founded as a Savigniac abbey in January 1135 and was absorbed by the Cistercian order in 1147. It was not an easy start for the community who had had to move five times before settling at New Byland, near Coxwold in 1177. Its early history was marked by disputes with no fewer than four other religious establishments: (Furness Abbey, Calder Abbey, Rievaulx Abbey and Newburgh Priory). However, once it had overcome this bad start, it was described in the late 14th century as "one of the three shining lights of the north". Its financial success was not as great as that of places like Rievaulx, but it was famed for its sheep rearing and wool exports. Its church was said to be among the finest 12th-century churches in Europe. In the late 12th century the abbey had a complement of 36 monks and 100 lay brothers, but by the time of the dissolution in November 1538, the abbey was host only to 25 monks and an abbot. In 1539, its site was granted to Sir William Pickering. The site is now maintained by English Heritage and is scheduled as an ancient monument by Historic England with grade I listed status. In October 2017, the west frontage of the church, including the famed Rose Window, underwent extensive conservation work to repair water damage and to repoint the stone walls. Impressive remains can still be seen, in the care of English Heritage, including the lower half of a huge rose window which was the inspiration for the same window at York Minster. An interesting feature is the preservation of some of the brightly coloured medieval floor tiles. An altar table (mensa) was also recovered, although that is now in Ampleforth, and a stone lectern base from the chapter house is the only example of its kind in Britain. Wimund - English bishop, later turned pirate, was held here after his capture in the 12th century. ^ Some sources say that Edward was at Rievaulx Abbey. ^ a b Behrens, David (11 October 2017). "Medieval mixture replaces 20th century concrete as restorers seize 'chance of a lifetime' to preserve Byland Abbey". The Yorkshire Post. Retrieved 27 November 2017. ^ Beadle, Brian (19 March 2010). "A cycle ride to Byland Abbey and Rievaulx". York Press. Retrieved 27 November 2017. ^ a b "Houses of Cistercian monks: Byland | British History Online". www.british-history.ac.uk. Retrieved 27 November 2017. ^ Ratcliffe, Roger (21 September 2010). "Great Yorkshire Walks : Discover the moors". The Yorkshire Post. Retrieved 27 November 2017. ^ Clark, David (2002). Battlefield walks in Yorkshire. Wilmslow: Sigma Leisure. pp. 32–34. ISBN 1-85058-775-2. ^ Trout, Thomas Frederick (1905). "XIV: The Fall of Edward II. and the Rule of Isabella and Mortimer". The history of England from the accession of Henry III. to the death of Edward III., 1216-1377. London: Longmans Green. p. 289. OCLC 63450678. ^ "Byland Abbey, North Yorkshire | Educational Images | Historic England". historicengland.org.uk. Retrieved 27 November 2017. 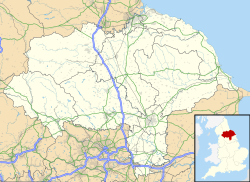 ^ "History of Byland Abbey, in Ryedale and North Riding | Map and description". www.visionofbritain.org.uk. Retrieved 27 November 2017. ^ "Byland Abbey | English Heritage". www.english-heritage.org.uk. Retrieved 27 November 2017. ^ Historic England. "Byland Abbey Cistercian monastery: monastic precinct, water-management earthworks, enclosures, ancillary buildings and quarries (1013403)". National Heritage List for England. Retrieved 27 November 2017. ^ Historic England. "Byland Abbey (Grade I) (1315790)". National Heritage List for England. Retrieved 27 November 2017. ^ Darley, Karen (18 October 2017). "Work under way to restore abbey". Gazette & Herald. Retrieved 27 November 2017. ^ "Byland Abbey". webarchive.nationalarchives.gov.uk. Retrieved 27 November 2017. ^ Campbell, Sophie (14 July 2006). "Monkish austerity was so 12th century". The Telegraph. Retrieved 27 November 2017. Byland Abbey website history, building and lands.